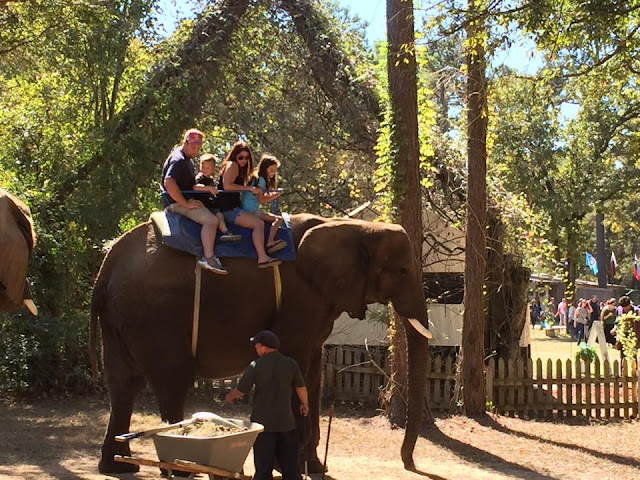 On October 18th, Nick & I took the kids to the Renaissance Festival in Plantersville, TX. As soon as we got there, the kids wanted to get their faces painted. and Alex went with the Hulk. and checked out some of the interesting things you come across at the Ren Fest! 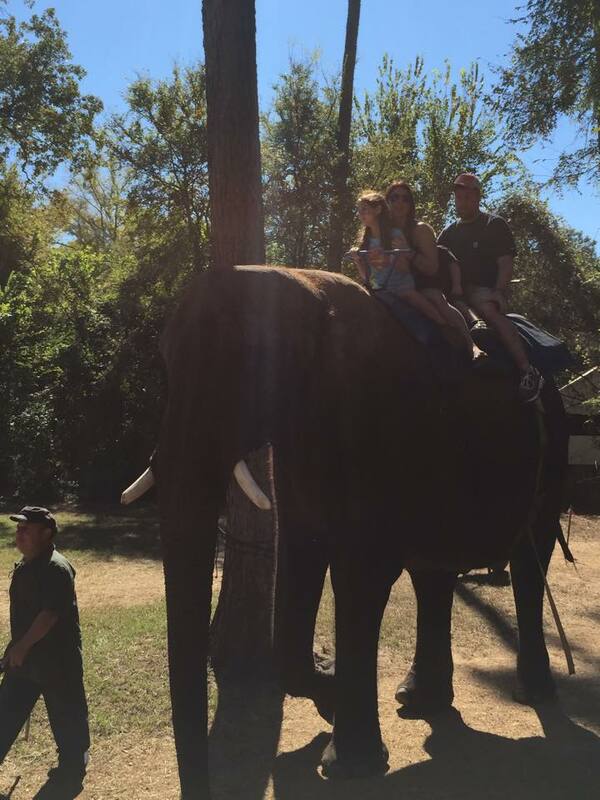 And then Addy & I rode an elephant. Then we went over to the arena & watched the jousting show. We were on Team France. Sadly, Team France did not win. Alex was begging to ride Neptune's Swing, so as soon as the jousting show was over, we did! And as soon as the ride started, Alex was begging to get off! After that we watched the awesome Whip Show. The guy used whips to pop balloons, snap a rose off the stem & even fire whipped stuff. It was very impressive. And it ended up being about the only thing that Alex actually enjoyed! We'd had a long day & it was super hot so after The Whip Show, we decided to head out. But before leaving, we had to stop for one last memento... a bird whistle! We had an okay time but it was hot, crowed, expensive & really not our scene. And the kids didn't like all the walking! We've been there, done that, won't go back. With back to school time also comes back to Girl Scouts! The first two badges that Addy & her troop earned this year (back in September) were the Brownie safety award & the first aide badge. Both these badges required a field trip to a fire station . So that's where we went for our first field trip of the 2015-2016 school year. After all the girls arrived, the firefighters took us on a tour of the station. They we went outside to the garage (Is it called a garage in a firehouse? Or a bay? Or a hanger? Anyone know the technical name for it?) to see the firetruck & the ambulance. And all the cool tools that they keep on a firetruck. Then one of the firefighters showed the girls how fast they put on their gear. And then he explained that even though he may look scary with the mask, he is still the same person that he was before. And gave them all high fives. After that, the girls went outside & they all got a turn to spray the firetruck's hose. Addy thought that was pretty cool! And of course, before we left, we had to get a troop picture with our awesome Sienna firefighters! On September 26, Addy & Alex were out of school for the opening of the Ft. Bend County fair. But instead of going to the fair, we decided to go to one of Addy's favorite places...the zoo! and then cruised around the zoo checking out all the animals. The kids also played in the African forest. Crawled through the tunnel in the Rainforest house. And pet the farm animals in the Children's Zoo. Well... Addy pet the farm animals in the Children's Zoo. Alex sat on this bench & refused to pet even one animal! He said they were dirty & smelled bad! We also rode the carousel. Addy rode on a zebra & Alex started out on an elephant. But quickly changed his mind & rode on the non moving bench seat. and rode the train around Herman Park. It was a fun day but we also had a really scary incident occur. While we were in the children's area, Addy disappeared. She & I were looking at the swan, she walked off & when I turned around she was gone. I went back to the play area where Alex & our friends were & she wasn't there. So I start looking for her & the longer it goes without me finding her, the more worried I became. So I grabbed the first zoo employee I could find & told him that I could not find my daughter. He asked me what she looked like, sent an all call over his radio & started to help me search for her. We rechecked the children's area & didn't find her. So I asked my friend to stay with Alex in the children's area in case she came back & the zoo employee & I started walking towards the zebras, which is what she had been asking to see all day. As soon as we walked out of the children's area, my friend called me & said that they found Addy & at the same time, the employee got a call on his radio also stating that they had located her. Where had she gone you might wonder, well apparently she was hungry & she was looking for food. She's matured so much over the past couple of years that I thought we had moved past her elopement issues, but apparently we have not. And so now my guard is back up.